A single photo of what appears to be a larger than normal iPhone front panel assembly showed up on Chinese microblogging website Sina Weibo on Tuesday, offering what could be the first look at Apple's next-generation handset. 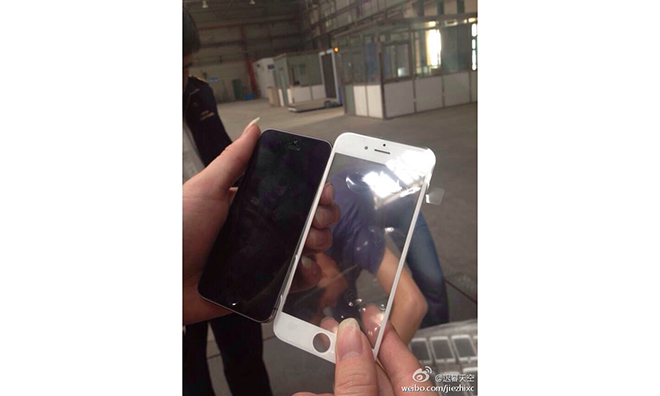 While the image is not of the highest quality, it looks as though someone is holding a black iPhone 5s next to an oversized front panel supposedly belonging to Apple's next-gen iPhone 6. The somewhat suspect photo was posted to Sina Weibo by user jiezhixc (via iPhon.fr). Taking a closer look, there is an immediately noticeable difference between the two front faces and it seems as though the iPhone 5s could fit width-wise into the purported iPhone 6 screen's cutout without much trouble. It is unclear if the larger panel holds a screen with the correct 16:9 aspect ratio used in all iPhones since the iPhone 5. The usual home button cutout is clearly visible in the alleged part, as are holes for a front-facing FaceTime camera, IR proximity sensor and pill-shaped opening for the ear speaker. Screen bezels look to be very slim in comparison with current Apple handsets, though the overall layout corresponds with existing models. Even if the part is not legitimate, the photo offers a good example of what a 4.7-inch or 5.5-inch iPhone could look like in comparison to a current-generation model. A number of publications and analysts, including KGI's Ming-Chi Kuo, predict Apple will bring two larger iPhone versions to market, likely in a fall product cycle refresh.